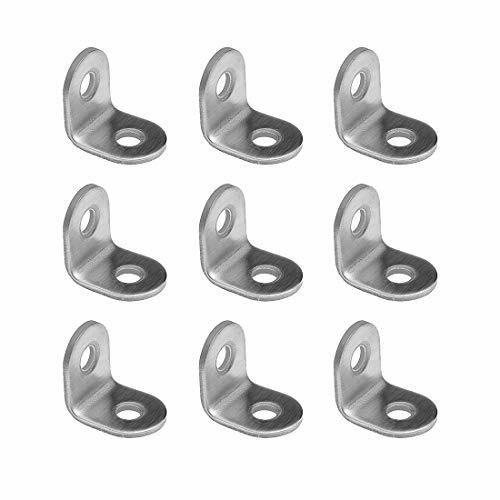 Bracket Size : 20 x 20 x 16mm / 0.78 x 0.78 x 0.62"
100PCS CORNER BRACES: Set of 100 Brackets, 20 x 20 x 16mm / 0.78 x 0.78 x 0.62", Weights 315g.NOTES: Screws are NOT included. RIGHT ANGLE BRACKET: 90 degree flat plate bracket, serve as a corner connected, like fastening chair, wooden table, wooden bed, windows, shelf, furniture, device etc. EASY TO INSTALL: Use drill bit while drilling l brace into woods, Designed for chests screens windows furniture etc. BRUSHED FINISH: Constructed from high quality Steel, No rust & corrosion. Used to strengthen corner joints against compressive failure. If you have any questions about this product by ABUFF, contact us by completing and submitting the form below. If you are looking for a specif part number, please include it with your message.